Doritos established Hotel 626, hotel626.com, to promote the brand’s bringing two intense flavours back from the dead during Halloween. Teenagers were invited to enter Hotel 626 online, and presented with a scary scenario, being trapped in a hotel with the only way out through unpleasant challenges using their webcam, microphone and mobile phone. Hotel 626 uses several groundbreaking techniques to dial up the experience. Your webcam sneaks a picture of you and shows it to you later, inside the lair of a madman. Your one salvation is a phone call on your actual cell phone with directions on how to get out. To make it scarier, you have to play in the dark. 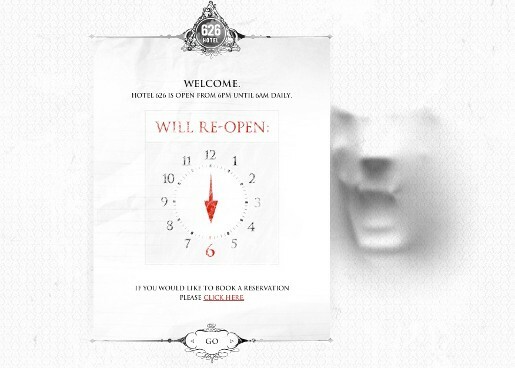 Hotel 626 is only open from 6pm to 6am. Players must maneuver through darkened hallways, a madman’s lair, and sing a demon baby to sleep in order to find their way to safety. Hotel 626 was developed at Goodby, Silverstein & Partners, San Francisco, by creative directors Hunter Hindman and Rick Condos, associate creative directors Marc Sobier and Hartley Rusen, art directors Henrik Rosander, copywriter Michelle Hirschberg, digital director Mike Geiger, executive interactive producer Amanda Cox, interactive producer Maggie O’Brien, account director Liz Kaiser, account planner Ted Florea, assistant account manager Amy Taylor, creative coordinator Karen Land. The site was developed at B-Reel, New York. Filming, CG animation and Flash animation was produced at B-Reel, New York, with director of photography Paul Evans. Backend and telephone technology was produced at Fatslice Co.
Music was produced at Plan8. Sound was designed at Dinahmoe and mixed at Plop. Visual effects were produced at Important Looking Pirates by VFX supervisor Niklas Jacobson, producer Frida Färlin, VFX team Jonas Andersson, Niklas Nyqvist and Yafei Wu. Hotel 626 has won a bronze at the Andy Awards 2009, a bronze for consumer-targeted site at the CLIO Awards 2009, a Gold Pencil at One Show Interactive 2009, a Yellow Pencil at the D&AD Awards 2009, two Webby awards, and was honoured for microsite at the AICP Next Awards 2009.